recent announcement from OriginOil that Paul Reep had been given the job of Senior Vice President of Technology seemed to have more going on behind it than the release suggested. While his impressive credentials—highlighted by 20+ years working with the Department of Energy and the National Labs on technology breakthroughs as well as facilitating interdepartmental communication about alternative energy at the Cabinet level—suggested that Paul was a good choice for such a key position, there seemed to be other reasons why he stepped in at this point in time. Paul didn’t come on full time with the startup, as he had a full plate already as Manager of Technology Advancement and Licensing at the Stevens Institute for Innovation at the University of Southern California, where he worked alongside researchers and scientists to identify and develop patent and licensing opportunities for USC-spawned inventions. Prior to that, in his role of Technology Program Director, and manager of Environmental Engineering at the Department of Energy’s National Environmental and Engineering Laboratory (INEEL), Reep was responsible for the environmental characterization of an 840 square mile government reservation, as well as the investigation of alternative technologies to be used to close defense and nuclear-related projects to meet the Resource Conservation and Recovery Act (RCRA), EPA, State and Federal mandated milestones. Reep also spearheaded an initiative for the DOE aimed at conversion of defense and energy-related technologies to strengthen the international competitiveness of the U.S. agriculture industry. The theme of this major multi-agency technology transfer initiative continues today, helping to enable the DOE’s Bio-energy Program. 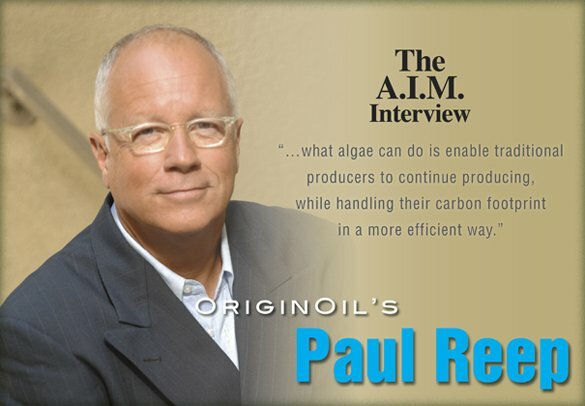 We spoke with Paul just after his presentation at the recent 3rd Algae World Summit in San Diego to find out more about his new job duties and his somewhat unique views of algae and energy. What experience from your DOE past pointed you toward the place you now find yourself at OriginOil? During my tenure with the Department of Energy I worked on all kinds of energy configurations, everything from nuclear to alternative feedstocks, where we were looking to use agricultural plants to perform similarly to petrochemicals to produce solvents, paints, adhesives, those kinds of things. That’s all available through fractionation of different agricultural feedstocks. I became interested in that also because the Department of Energy has used different kinds of plants to remediate the environment. So I find that plant systems are quite elegant in their efficiency and in the tasks they perform and the benefits for society they produce. So you worked on agricultural interests with respect to energy for the DOE? How did that relate to what the USDA was doing at the time? There was an agricultural interest at the Department of Energy for sure, and one of the things I did when I was with there was to start a DOE agriculture program that involved most of the national labs. One of the things we were able to accomplish in that program was to get a memorandum of understanding signed between then Secretary of Agriculture Mike Espy and Energy Secretary Hazel O’Leary, which was a cooperative agreement that would have the two agencies working together, primarily to share cold war technologies with the agricultural world and the agricultural business. Many of those technologies were command and control based technologies, where you could target specific applications of fertilizer or different aspects of on-the-farm management where spatial and temporal information is important for a producer—just like it might be for a commander in a battlefield. How did the agricultural world view the technologies you were overseeing to improve the processes for energy crops? Based on my experience, in trying to get producers to be the innovators, be the early adopters of technology, they do things on a cost basis, and are very concerned about the bottom line. The culture they live in, largely a monoculture, is driven by the corn and soybean industry in the Midwest, and it isn’t so quick to adopt and change. For something like converting farms to algae cultivation, I think the tobacco producers might have a more symbiotic relationship. There is more opportunity for them to move away from the production of tobacco into energy crops. But, in the Midwest, production is likely to stay the same for the foreseeable future. Are there agricultural lobbies working against algae? Are there barriers to algae’s evolution as a farm crop because of supporters and producers of other energy crops? The U.S. Corn Growers Association, the U.S. Soybean Board, and all those other agricultural lobbying groups are funded through checkoff funds where the producers pay for representation and things like coming up with slogans such as “Milk does a body good.” Well, the algae industry does not yet have check-off funds to support a large lobby initiative, so that could make things seem somewhat restrictive. It came to the point, from my view, where you could see that OriginOil was really starting to be ready to go to the dance. And I think this engagement with MBD (Energy, in Australia) is really our first real prom, if you will. And like any other prom, what goes on afterwards is going to be really important. When I met Riggs a year and a half ago I was impressed that OriginOil’s business model was not like other end-to-end algae companies, but rather they were looking to isolate one of the elements of the value chain—in their case, extraction—and brand their solution to it. He seemed to anticipate where we are today, with partnering becoming very popular to address the complementary links of the chain. How has that played out from your view over the past couple of years? I think what we’ve been able to do is attract partners that recognize that we’re not going to be a competitor, but rather someone who can complement what they are doing. The World Waterworks engagement we have, where they are supplying their Dissolved Air Flotation (DAF) system, gave us something that we’ve used to make dryer and better feedstock. And it introduces the DAF system into a completely new market. 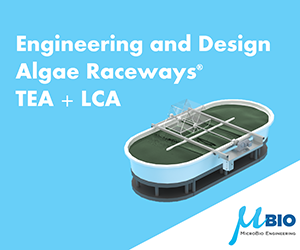 World Waterworks principally serves the wastewater industry, and now they can also be in the algae industry, and use our technology as they go forward and engage other partners. So I think that the synergies and these symbiotic kinds of relationships are really important. There is so much to go around, the problems are so massive to solve on a global scale that for us to be concerned about who is getting what ahead of the other guy, so to speak, is really not a very collegiate view. Why did you get more heavily involved with OriginOil at this point in time? Where is the extraction phase in its evolution, as far as OriginOil’s approach? When will you consider it a problem solved? One of the first things that we have to be able to do in developing a technology is to make sure the results are repeatable. We’ve been able to do it most of the time successfully in the lab, but to actually put it in a field situation where we are using someone else’s algae, someone else’s feedstock, using their facilities…it’s really trial by fire, certainly for our 20-gallon system that we recently deployed in Australia. So, it’s the repeatability, and then to be able to demonstrate its scale. Those two things are probably the key components right now. And that makes our ability to go to the next jump in scale very feasible, very doable. What is the scale of the work you are doing with MBD? We’re at basically at a hectare right now that we’ll be working with for the balance of this year. And it will go to something like 10 hectares next year, and then to 100 hectares in 2013. As far as the eventual biomass production…that will depend on the species—whether it’s a salt or fresh water variety, what solar radiation is taken in, what the par values are for their utilization of the solar energy, it all varies quite a bit. Why did OriginOil get involved with MBD, an Australian company, in the first place? We knew that one of the ways we can get the cost down in algae production is by focusing on a problem that needs to be solved, so we decided to focus on the CO2 problem. Australia is being very proactive about this and that’s why we are working with MBD Energy, to help them solve their CO2 problem. What feedstock or what materials result from doing all of that will be determined at a later date, once we shake out how it really works. But they are solving their immediate problem. Anything like oils or other products that come out is just an added bonus. So, at 20-gallons per minute, describe the input and output of your part of the system, with respect to the flow materials? It comes in as liquid slurry, it’s opaque, you can see that there’s biomass in water. What comes out of our system is highly concentrated, because the cells becomes disassociated with the water component, and flocculate out, or the cell material lyses and drops out of suspension. In Australia we go to a downstream unit, a way to concentrate that biomass more using the Dissolved Air Flotation system. From that, the biomass then becomes something you can hold in your hand. It’s kind of lumpy, very pasty, and has a dry weight concentration of somewhere around 9% solids content. There could then be another step to separate the oil. What we’d like to be able to do is develop the fractions of the oil that we’ve been able to extract so we can produce different products. 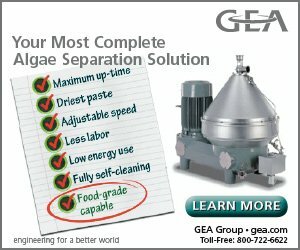 But we think that’s really the job of a downstream refiner and what we are sticking to right now is what we do really well, with so little energy, which is to get the water out and get this oil and biomass together in a paste, and do it in a way where we have a standard biocrude in a standard format. I think that that’s where we’ll be able to have real drop-in fuel opportunities—by providing basically a petrochemical cracking plant feedstock that is of known water content, known oil content, known biomass, so that they know what they are getting. The algae industry is going through an evaluation as to where fuel is going to fit into the big picture. You talk about high-value chemicals as the first phase of the industry, or maybe it is the long play? What do you see as the pathway to fuels, and when? There is considerable debate on what kind of petrochemical resources are still resident on the earth for our use. But, we do know it’s a finite resource. In our tag line we refer to OriginOil as a true competitor to petroleum. And I think from one sense that’s kind of where we’re going. It’s certainly very competitive to petroleum. But we want to be complementary to petroleum, because we will continue to use petroleum for a number of years. We don’t have the machinery and the infrastructure to really make this light switch instantly turn on. So I think what algae can do is enable those traditional producers to continue producing, while handling their carbon footprint in a more efficient way. We are a solution to help them, really, with their industry. Fuels are certainly one place where one can go with biocrude, but going with commodity chemicals is a really good area to focus on now, given the profitability difference between that and fuels. So, in our model, the path to fuel is 1) carbon sequestration, 2) commodity chemicals, and then stepping into the lower value products, such as fuel. Australia has been very aggressive about addressing the CO2 issue, investing $4 billion so far. Is that a model for where you think other countries will go? I think the events of this year, with the changes in weather particularly, more people understand that climate change is something that is, or can be, close at hand. Things are not going to be like they were in the past. Europe has a $40/ton carbon penalty looming for them. The Australians see this as an important environmental and economic situation for them as well, so they’re being proactive. So what is your hope in this area? If you had the ears of the top decision makers in Washington, what would you tell them? I think it’s really important for this country to develop and adopt a comprehensive national energy strategy that transcends the election process. It’s something that we need as law, something that deals with appropriate technology, and the adoption of those technologies where they work well. There is a place for all of them. Mobile fuels become a little bit more challenging. We need to have a national energy policy that addresses the different kinds of energy stocks that we are going to be developing and the different kinds of mobile fuels that we’ll develop as well. Certainly our national security is hinged on our ability to be energy independent. What’s keeping you from retiring? The answer to that, as I’ve told my kids for the last 20 years, is legacy. I want to be involved in an organization like I am right now, where we can effect change and make a societal impact that my kids and their kids will benefit from directly. It seems like quite a few people have come to this industry as kind of an after-industry in their careers—both because they don’t want to sign off yet, and they see the importance of what can happen here. I don’t see myself as important by title. I’m important by what I do. And I think it’s important to participate. I think it’s important to let people know that there are examples where you can actually take technology and integrate solutions. You can go out there and solve someone’s big problem and even make money doing it. Do you feel there is a loss of momentum or enthusiasm in this industry due to some of the hard work and tough science that people have had to deal with? I think there will always be early attrition, because typically when someone gets into a technologically-based business, no matter what it is, some think that they can do everything—all things algae, in this case. But if you try and build all of the possible products out, you can end up killing yourself in a business that lacks focus. We know that in real estate it’s about location. In business it has to be about focus. And, for us, everything that we work on in our company has to touch our single-step extraction technology. So if we look at a new innovation in growth systems, what’s important to us is how that growing system affects and impacts the efficiency of our extraction technology. If downstream someone comes up with a way to extrude a biomass to get a certain fraction of oil, we have to ask if that affects how our single-step extraction tolerances are set. We’ll look at that because we have to be flexible enough to scale, and be reproducible—both on the inlet side and the outlet side. If you lose focus of that reality, I think you are going risk the death spiral. For a lot of algae’s producers, I think it would be really interesting to see whether there is an answer to the question: what problem are you trying to solve? And I think a critical look will say, maybe they don’t know yet. At our company we are clear about what problem we are trying to solve. We are trying to solve the problem of our customer, number one. And that is, how do I get rid of CO2, and number two, how do I separate the water from the biomass? Some of your biggest successes in national energy program development had to do with communications—connecting the dots and putting people together. This is obviously needed within the algae industry, as well as between the industry and other technology solutions providers. Some in this industry complain that a lot of the necessary scientific progress already paid for by tax dollars is just sitting on shelves, hidden from those who could take great advantage of these pre-existing solutions. What can be done to facilitate more communication, as well as to access more of this kind of information? I think the Federal Laboratory Consortium (FLC) is a great untapped resource. It is the only venue that is organized out of the national laboratory system that really invites the participation of industry. Through the FLC, the Department of Energy can showcase all of the technologies that they’re working on, and the intellectual property and patents they have available for licensing to industry. So, what could be done to help this agenda and drive some of this policy change is to use the FLC as the way for industry to engage. To me, having been at the National Lab for a total of 20 years, I see them as an incredible national treasure. How would one spark that to happen? You could get on the phone and call your congressman and say there is a group of us here at this company who want to engage the resources of the national laboratories. The labs are chartered to do that. The Department of Energy certainly works with all the big oil companies. They understand the system. So you think this an unexploited resource for algae developers as well? Totally unexploited. The DOE is a resource that typically engages industry where a commercial solution is unavailable. 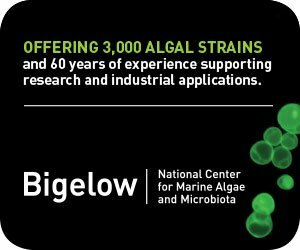 So when you are trying to develop an algae cracking system or a fractionation tower and there’s nobody that has one and you want to design and build one, you can go to the national lab and pay them to do the research for it. You might even see problems you have that have already been solved there, and you wouldn’t have known that until you actually found out what’s been going on inside the national labs. And as taxpayers, I think we ought to take advantage of this. So call your congressman, or go on the FLC website and find out when the next meeting is going to be, attend the meeting, be a speaker, be on a panel, and say that there is an algal industry out there and that we want to get our constituency better connected with the Department of Energy’s national laboratory infrastructure.